Love my new vacuum, light weight. Can't go wrong with a shark products. WOW! Compared to my other Shark this is a Mercedes! Of course, my other Shark was much cheaper, maybe a Honda Civic. So, after vacuuming my whole house and keeping in mind what killed my other Shark, I can see the advantages of the DuoClean. First, it is larger and heavier with better suction. True, heavy means more tiring but it also means better contact. Second, this model has a brush roller that is removable for cleaning, which is a must for me since a blocked brush caused the death of my other Shark. Easy to remove and you get a cute little tool that fits inside the sweeper head and works well to help remove the hair etc that might Immobilize the brush, which could burn up the motor. Third, it has a removable hand vac that is available all the time since it’s built in. I used it to do corners, kitty litter and the vent covers. It would be great for stairs but I don’t have any. Things I’m not so thrilled with—heavy, can’t stand up by itself and expensive. Right now, I’m ready to forget these minor gripes because it really does a wonderful job of getting the dirt out of even a deep pile rug, picking up cat hair and mine, and has a removable hand vac which also has great suction. All in all, I highly recommend this vacuum with this caveat—CLEAN THE BRUSH ROLLER EVERYTIME. Even tho this model has a light that comes on when the brush roller is stuck, don’t take any chances. This is a great vacuum cleaner. I have a Great Pyrenees. He produces fully grown dust bunnies & this vacuum tackles them easily. Love the design! The swivel head takes some practice, as does any new tool. Once I mastered the movement, so perfect for moving around furniture & under tables. Easy cleaning! While it doesn't easily lean up against the wall for storage, I am happy to trade that feature for the easy cleaning and not having to bend down to empty the bag!!!! I love this vacuum. This is the second shark that I've owned and it's wonderful. I can vacuum large particles without them being pushed or shot across the room. The front roller just roles over them pushing them into the the suction path. Great for carpet, hard wood and tile floors. Worth every penny. So easy to assemble. Very lightweight. Love the top that comes off so you can use it like a dustbuster. Removes cat hair from upholstery like a champ. So easy to take apart and clean rollers and filters. One click to empty main dust cassette. Two things I wish I could change- cordless would have been a little more convenient, and the unit is very top-heavy and cannot stand freely on its own. It does come with an easy to install wall hanger, so that's a plus. Love it! Bought the stick vacuum for my daughter who has hard wood floors and carpet. She couldn’t be happier. It’s very light weight so getting up stairs is easy. Power is great whether on carpet or wood floors. Would highly recommend especially for apartment living. This is our third Shark Rocket and by far my favorite. We have 2 very large dogs and it picks up everything they track into the house. This Shark Rocket really gets the job done. The dual rollers spin in the floor head and literally pull in debris and dirt, even piles are handled with ease. This model, the HVV381 didn't come with the pet attachment that is a miniature of the larger floor unit (I ordered it from Shark directly). It also has the rollers for pet hair on furniture and is light enough when attached to easily maneuver couches, chairs, and other items that may collect pet dander. The filters are readily accessible and easily changed. This vacuum will not let you down by getting plugged up like so many others with the filter bag system. I'm really impressed by this technology. Great vacuum. You will need to clean the bottom brushes out by hand quite often. Easy to get around in tight spaces. Super powerful. Would definitely recommend for a smaller apartment. Super love this vacuum. It's easy to push over plush carpeting and easy to vacuum underneath sofas. The only niggling point is that you really do have to take it apart for storage if you don't want it crashing to the floor and breaking. The niggle point is still worth it because this vacuum really is fun to use! ABSOLUTELY the best vacuum I have ever bought. I have had a Rainbow for 20+ years and this is more powerful than my Rainbow. It has great sucking power. I was ashamed of how much dirt it sucked up. I do wish the dust collection bin was larger. Super powerful! I really am glad I chose this one. I like the functionality. It's top-heavy and strains my back a bit. Also not great on thick-pile carpet. I like shark products I purchased this as a Christmas present and I am hoping they like it as much as I do. Purchased for my daughter and she loves it. I am tempted to buy one for myself but still using my Kirby! Would certainly be lighter that's for sure. Maybe I am talking myself into my own! 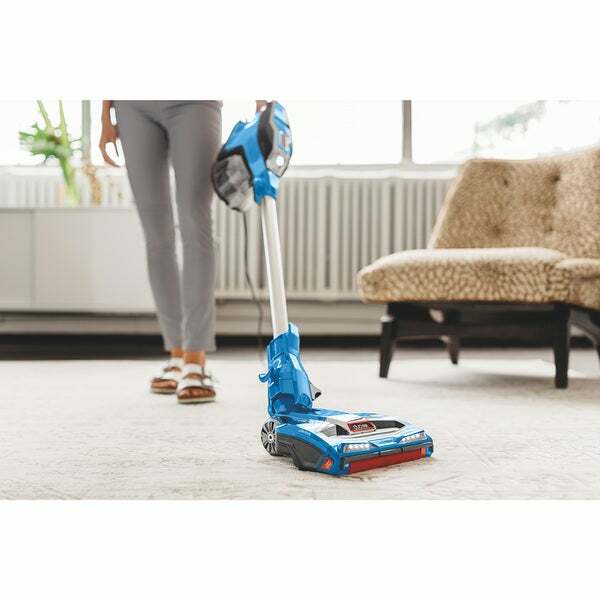 "Hi, I have a pocket true pet stick vacum, but the hose that is on the connected on the bottom of the vacum to the stick has brok is there any way the I can get this hose or replace the main part"
"What rocket duoclean has led lights?" My daughter has one and I love it. My wife was looking for this product and I wanted to surprise her. "How good is this on wood floors?" Very good, I love it and would buy it again. Excellent purchase. "What attachments does this come with?" This set Includes: under appliance wand, duster crevice tool, upholstery tool, pet multi-tool, on board storage clip, wall mount, accessories bag. "What attachments does it come with, does it have a motorized brush? And, very important, what does it weigh???? Thank you *"
"Does THIS model have the LED headlight or not? I wont buy a Rocket unless it does, because that headlight shows me exactly what is there, and I clean houses for a living. Thank you. Ann"